At DuPage Swimming Center, we understand that you lead a busy life. You juggle a lot of moving pieces and are responsible for remembering a hundred details on a daily basis. But, this shouldn’t keep you from enrolling your child in a Naperville swim club. You want your kids to learn how to swim, but adding another activity to your busy lifestyle seems overwhelming. It doesn’t have to be! We want to work with your busy lifestyle by providing you with an easy, convenient and fun way for your kids to take swim lessons. The following are three reasons to enroll your child in a Naperville swim club at DuPage Swimming Center. We offer private lessons for children ages 3 and up, which are more individually focused and can be scheduled at times that accommodate your calendar. We also offer group lessons for children ages 3 and up, which are more regularly scheduled. This kind of consistency and regularity can make your calendar easier to manage. If your child is younger than 3 years old, we also offer parent/tot classes in which parents participate and learn a variety of techniques to help their child stay safe and have fun in the water. We do offer group and private adult lessons as well, allowing both you and your child to enhance your swimming skills, without demanding too much of your time. At DuPage Swimming Center, we have no registration or enrollment fees, and a flexible cancellation policy. The pricing of lessons depends on the number of classes you want and the number of children you have. But the great thing is, you don’t have to pay any fees or additional costs beyond what you are paying for the lessons. It is easy and free for you and your child to sign up! We also make it easy for you to cancel or reschedule your lesson, in case something else pops up in your schedule. You may cancel up to two hours prior to your lesson at no charge. If you cancel within the two hours leading up to your lesson, you will be charged a $5.00 cancellation fee. Another reason to join is our color-coded swim level system, created by an Australian Olympic swimmer. There are 10 levels in all, beginning with level one: Comfort and Submersion, and ending with level 10: Swim Team Prep. Children are evaluated before they begin to determine their level, allowing them to receive the training that will help them improve beyond their current level of skill. It also ensures children are grouped together based on skill level, encouraging them to challenge one another, without feeling pressured or discouraged. 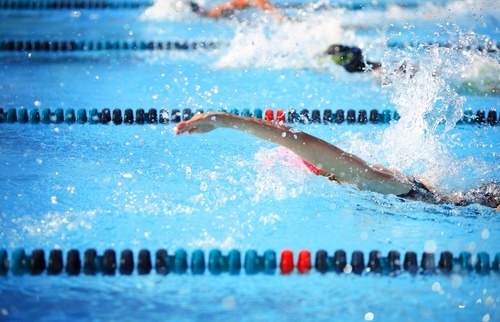 If you are interested in learning more, and are serious about improving your or your child’s swim technique, don’t hesitate to contact the DuPage Swimming Center today!